How can it be, that our favorite day of pumpkin holiday magic has arrived so soon? Sweet ole owls all in a row. For what is a trick and a treat without sparkles? We follow the warm autumn light into the Halloween house. There is more enchantment than hauntings, I can assure you. The adult children aged 30 or more, put on their costumes and dance with cackles galore. The geese carry the crows, always on their back. Of course, you know this, I know. You have just the psychic knack. And polka dot tea cups come out in droves, clink clink! To beckon you in for a night of delightment and tales that may make you shiver. Hot cocoa and a cozy fire to warm you back up. And caramel corn to give you the energy to dance all night long. The magic is there for the taking, just reach in and grab it. It's just waiting for you to take the leap. Make a wish on the count of three. Close your eyes and feel a tap on your shoulder. Don't worry, there are no ghosts around here from Boulder. Although I can not speak for how the hand print in the fireplace got there. It's been there from the day I moved in you see. So perhaps you know the tale, and are prepared to tell me? Either way, have no fear. The fairies are around you, they travel far and near, to light the path on All Hallows' Eve, for only one night a year. And if you truly believe, they just may grant your wish. To let them know that you'd like to meet. In dream land, in fairytales, in places of the heart. As I curtsy and thank you for being so swell! Waiting and hoping that you share some of your own folklore. Now run off and beware of the imps. And don't forget, the trolls and elves live for the tricks. So check your locks and brush your teeth. On this one and glorious yearly Halloween! Cackles to you, from my broom stick up high!!! I shall see you up in the moonlit sky! Magic, and stars and wishes to you!! PS: Our dearie, The Mad Hatter, sent you a gift this year my pretties!! He wrote a Halloween song just for youuuu!! This is a snippet of the song, we have it on cd, I'll post the rest sooooon! October, oh how I love you. The weather changing, the leaves turning, the rain and breeze swirling, the twinkle lights glowing and pumpkin pumpkins everywhere. I have been trying to just immerse myself in every single day this month. I'm not sure why it slips out of my fingers so very quickly. I think the only way to really hold onto it is with photographs. But the best part of the photographs is the gathering of random bits and bobs for the photos. Stealing some leaves from the garden. Zinnias grew like bean stalks, huge and strong this year. How I love their fuchsia petals with orange and blue and black and gold. Something I just adore doing. The ritual of lighting the match and slowly bringing it up to the candle. And then the golden glow only a candle can impart - true magic. There must be an easier way - this is the thought that swirls through my mind these days. And then I thought, of course there is! I decided I would simply post my own Halloween post in a few days and if anyone happens to do a post I can link to it in a special spot at the bottom of my own Halloween post. Easy as pie. Right now I'm simply thoroughly enjoying these last days of October (insert tears). I don't want it to go away so quickly. Alas, there is nothing as sweet as the thing that is slipping through your fingers. The thing you can not grasp. SO the best thing to do it close our eyes and smell the air. Memories are like a gift from our brain. It's like, an attic in our mind. Why do we love autumn like this? Let's pinky swear to really enjoy these last 7ish days or so. Thank you for playing in my last post, fun fun fun! I know nothing is as a good as the blog, not even Instagram, but if you watch my stories there (stories are 24 hour videos) you see that I am often up to all different types of art. It depends totally on my mood. Sometimes I want to try something new, other times I just want to smoosh all my fave colors around. I've made stacks of fluid art pieces and now I'm making stacks of old school abstracts. Just for the sheer joy it brings to my soul to have an outflow. I read once that creative type people are highly emotional and if they do not have an outflow their own thoughts can drive them a bit bonkers (raises hand, been there!). And so, in order to have some balance, there must be an outflow. This is where my painting emotions comes in for me. I also find a creative outflow in cooking, playing piano, gardening - and I find a good dose of mindfulness in treasure hunting. I love to go alone, at an odd hour when a rickety antique store is usually empty. I listen to the fans and smell the old smells that waft around with beautiful familiarity. I listen to the old time music and I just decompress totally, looking from shelf to shelf and nook to nook. I am surrounded in my life by old things. Antique furniture, books, dishes, collectibles, houses, paintings. I think there is nothing more beautiful than the mash up of old with wild color. Antiques and explosions of color. It's a thing, it works and it creates a sort of balance of opposites. And so, I have been gravitating back to my old love again. An outburst of emotions on canvas. The nonsensical but joyous explosion of splashing paint. Turn up the music and mash it up! It's your joy and your truth. You might have someone you care about dearly say to you flippantly, It's not my thing. And you can do what I do, just say to yourself, I don't care. I love it, it's my thing, it's my joy. It's so easy for us to allow people to crush us. Not everyone has to like what we do, and that is great. It's wonderful to be so different from each other. But if you love it, and the outflow is amazing, do you really honestly care what someone thinks? I've had people say to me that they don't like something I've made and then a couple weeks later say, I've been thinking a lot about the piece I thought I didn't like and now I LOVE IT and I need to own it. So, you see, people's opinions are changeable and fleeting. The important thing is what you yourself think. That's all and nothing more. So you see, not everyone likes the same cup of tea. And other's might prefer mineral water with ice. You just never ever know. My dad says every brain is its own world. You can't even try to make sense of it or please others. You only get one chance in life. So, you best be making yourself smile, right? I think I heard Paul Allen say, do things with a sense of urgency and determination. DO what you love friends. Live in the moment with urgency! That means stop to smell the roses, skip, smile, laugh! Yesterday is history, gone adios. Tomorrow is an invention in your mind. But today is here now. You can click on them to see a clearer version if you fancy. And so, I'm joyfully painting very often. In fact, right now I'm working on a very detailed painting. But fun too, to get serious and hunker down and be really present. But it's the wild and free that brings me back to me. The crescent moon wants to keep showing up, as well as scribbled thoughts here and there. I think I was listening to this on repeat when I was painting a lot of these. Incidentally, I'm really obsessed with playing this loud right now. High high hopes my friendsss!!! Have a ton of funnnnn! Smiles, laughs, joy, freedom of self, arms outstretched in the air. Painting, dancing, crying, laughing, loving. My dad says you should cry and laugh every single day. You can cry from joy too ya know? Well, you know that I'm certain. Stars and hopes and joy and love! 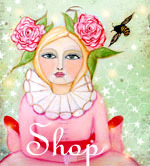 Let me know what print and card pack you'd like from my shop, xoxo! I am finally back, yippeeee! I spent most of September in Europe and took some time to paint and decompress when I got back. It's finally cooling down in the desert and inspiration is everywhere. It's a good day when you can finally go outside and open doors and windows, magic! So now that I have returned, I want to share a little something I meant to share last month. I wrote up a little something called Creativity is Contagious! I really enjoyed putting this together. We should celebrate with a giveaway, because it's been ever so long since we've done one. And now that the holiday season is beyond upon us, with Halloween enchantment floating all about and autumn vibes wafting in with their deliciousness, it's time for some real old school fun. So, simply say hello in comments to enter for the chance to own a copy of this magazine. A print of your choice from my shop and a 5 card pack too. There's over 200 items to choose from, so I think you'll find something you can enjoy. Yipppeee yaaaay, time for some real fun! I just adore this time of year, don't you? When the heat starts to dissipate the plants come back to life, the dogs can go in and out running around and I can go roam outside with a cup of tea and a cardigan, squeeeeal, I just long for this for 6 months and now here we are again. I'm deliriously happy my friends!!! Welcome October and all good things. Simply say howdy, hello, tell me how you are. What's bringing you so much joy right now? Anything really, pop it into comments, and I'll enter your name into the hat. Lots of love from me to youuuu! !